I have just returned from a trip to Iceland. What a wonderful and isolated country! This year I had no set destination. So I simply chose the cheapest international ticket, which turned out to be a direct non-stop to Iceland. So our adventures took us into the wild expanses. 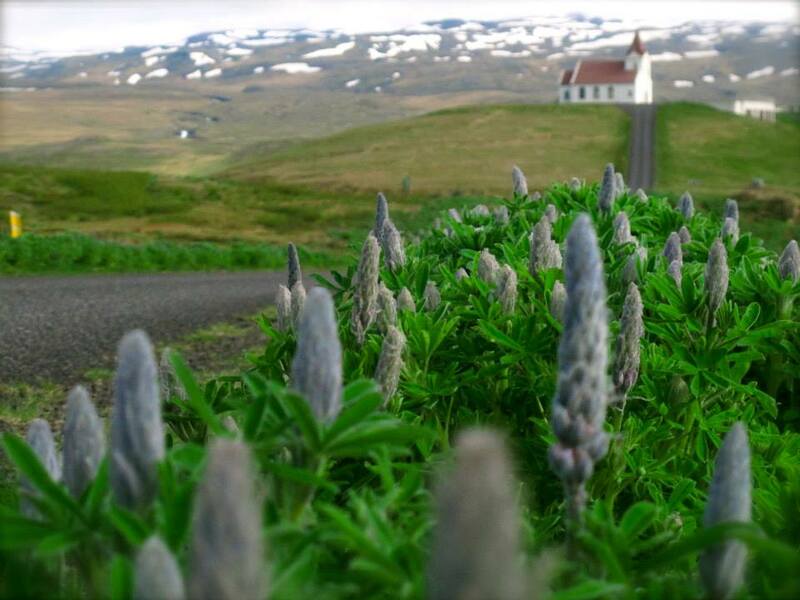 Highlights include, coffee, licorice, and hotdogs, geysers, standing under and behind waterfalls, road trips, glaciers and ice, secret and not-so-secret-hot springs, boat rides, sweaters, sheep, falling in the mud, half-breakfast, and day light 24 hours a day! Because Iceland is an island, fish is abundant, and I was spoiled. When I returned home to my land locked state of Colorado, I went to the grocery store and reluctantly bought a pound of cod from the seafood counter. 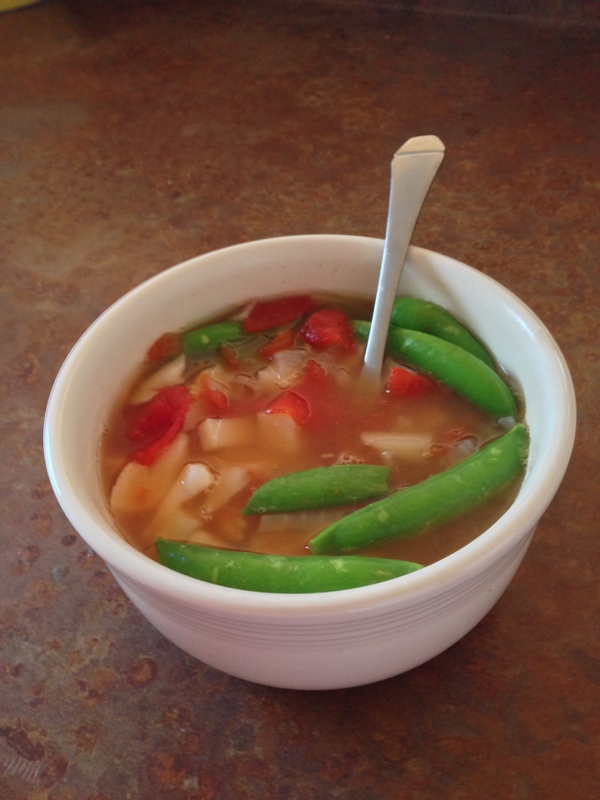 I made this simple soup with a few modifications and I must say it was delicious! I highly recommend you try this! Of course if you are watching your carbohydrate intake please omit the potatoes. Bring broth, onion, 1 1/2 cups tomatoes, potatoes, basil sprigs, red-pepper flakes to a boil in a large, deep, straight-sided skillet with a tight-fitting lid. Reduce heat and simmer, uncovered, until potatoes are crisp-tender, 6 to 8 minutes. Season cod with salt and pepper, add to broth mixture, and cover. Simmer until fish is opaque throughout and just cooked through, about 7 minutes. Remove and discard basil sprigs. Add sugar snaps, remaining 1/2 cup tomatoes, and lime juice to skillet, gently stirring to combine; cook just until warmed through. Divide fish, vegetables, and broth among 4 bowls. Garnish with basil leaves, drizzle with oil, and serve with lemon wedges for squeezing. I have not been able to find a reliable source for farm raised chicken in the area, so this chicken was store bought. It was on sale for less than $6.00 for 8 chicken thighs. This was a good deal as I was able to make this stretch into 6 meals. That is less than a $1.00 per meal. So although ethically I feel bad for these poor chickens I did get a good deal. The shopping list is a little long, but hopefully you have some of this in your pantry…and if you don’t, lets stock up your pantry! My little bean is 6 months old this week. So we are starting real food. 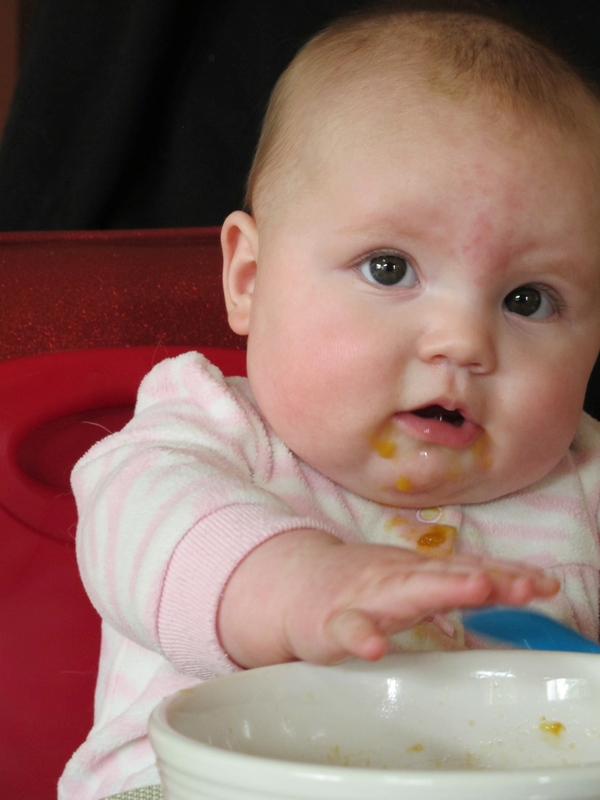 It is going alright, she likes peaches ok, she really likes avocados but she dislikes sweet potatoes. Which is a shame because I cooked a whole sweet potato. So I incorporated it into todays lunch…but if you are trying to make this lunch you could skip it in favor of cream cheese stuffed celery and salsa, or plantain chips with roasted peppers and goat cheese, or oven roasted bell-peppers, onions and tomatoes. 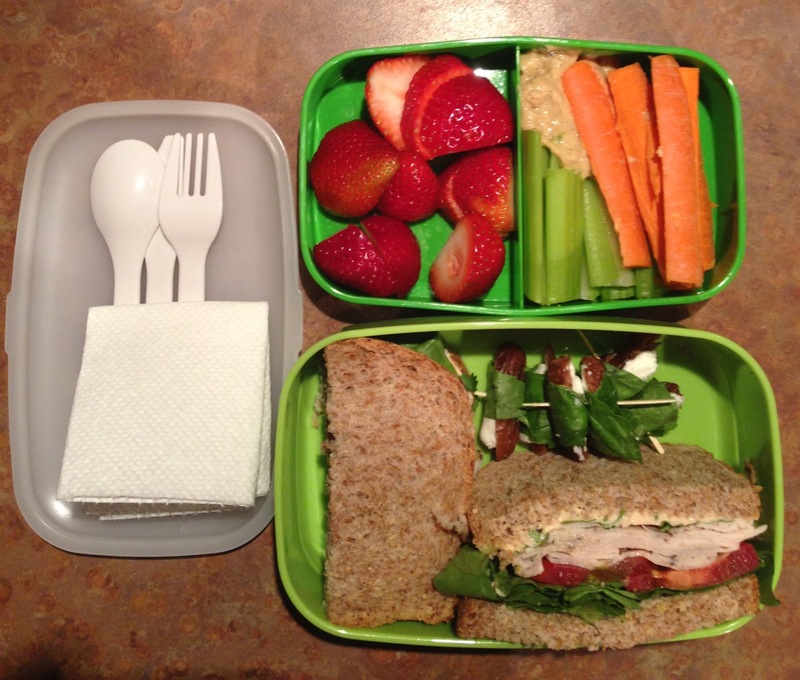 Maybe you have seen the Bento sites; elaborate, beautiful, cute and artistic lunches. And while I appreciate them tremendously, I have no time at the moment to make them…maybe when Miss E. is older. My goal is create a healthy, nutritious and filling lunch. Something I can look forward to eating, something that I feel good about eating. As you hopefully can see, I am using some of the same ingredients from yesterdays lunch but with a new twist. 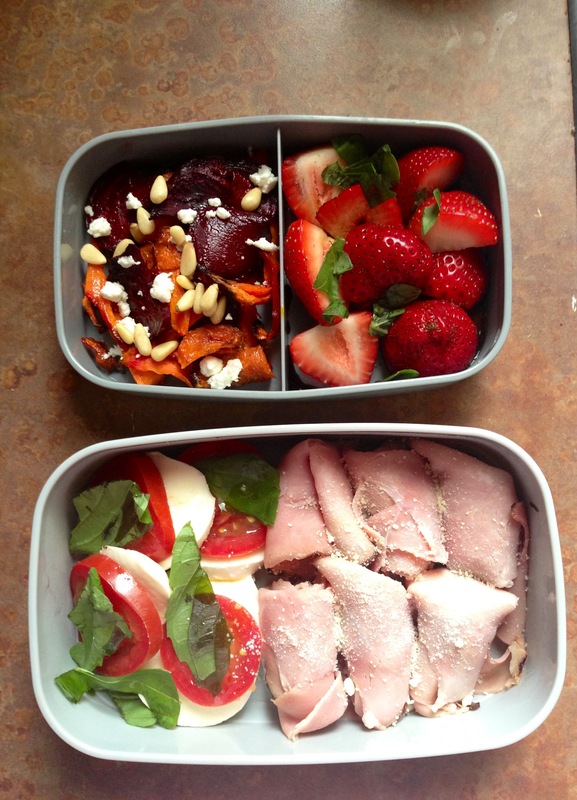 Strawberries, goat cheese, basil, tomato and deli meat. For the roasted vegetables: Start them before preparing the rest of the lunch. Cut vegetables into nice bite size pieces (but not too small or it will burn). Toss with small amount of olive oil and season with salt. Place under the broiler for 10 minutes until roasted and the sugars caramelize. The hardest part so far about preparing these lunches is the planning and coming up with combos for the foods I have available. Buy what is on sale and what is in season to save money and take advantage of the freshest ingredients. If you are anything like me, lunch time is my down fall. It didn’t used to be so bad as I would generally just skip lunch. No problem. But lately I find myself starving, wandering the grocery aisle looking for something to eat for lunch. If only I had prepared my lunch at home! I would lament. When you are hungry the simple thing to reach for is processed food with a ton of carbs. And that just won’t do. So this week in my attempt to try something new I am making low gi and interesting lunches. There are a plethora of blogs that cover this topic, so feel free to look here, here and here. 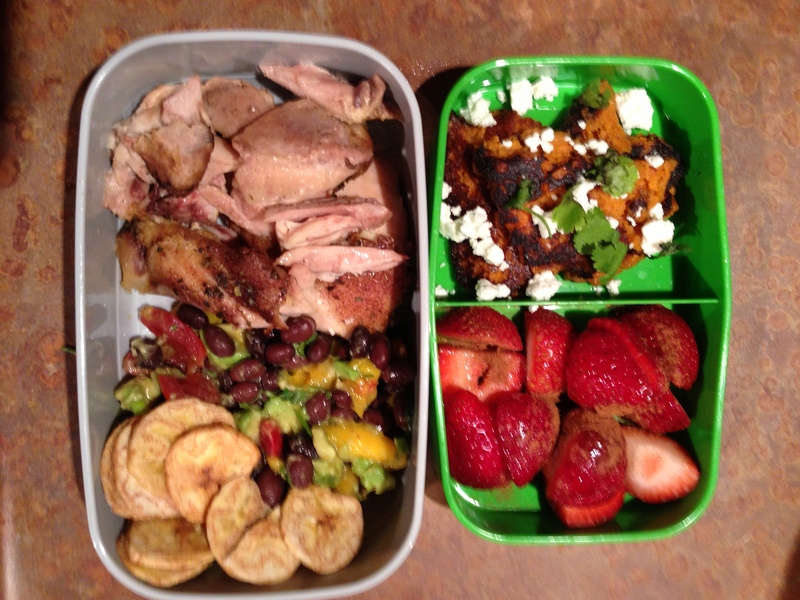 My rules are: it must fit in my bento box, it must take no longer than 15 minutes to make, and include low carb whole foods. Hopefully this helps you out and gives you a great start to the week too! This week is always the week that I develop my eye twitch. Every. single. year. There is so much going on and so much to do. Big Art shows and ACT and AP testing and prom and graduation and mothers day and gallery showings and community involvement…oh did I forget to mention I have a baby who still needs me? and a husband? and a house? and a dog and three cats? and bees and chickens? and a garden? Sheesh. 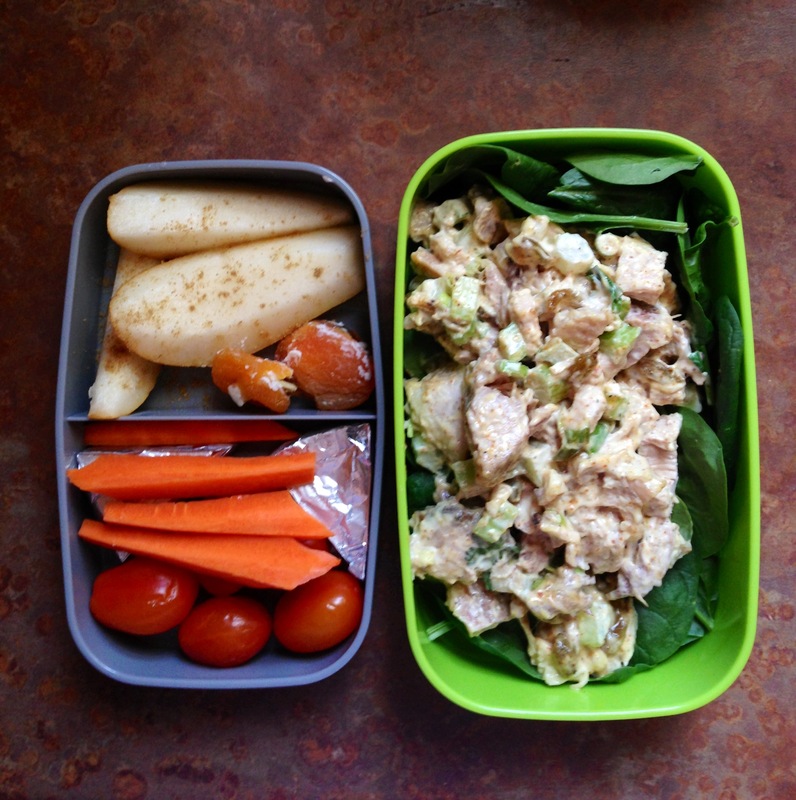 I want to do a series on PCOS/low glycemic lunches…and I will I promise…someday. “Time, time, who has the time?” said the little white rabbit. So here is a quick and easy meal. 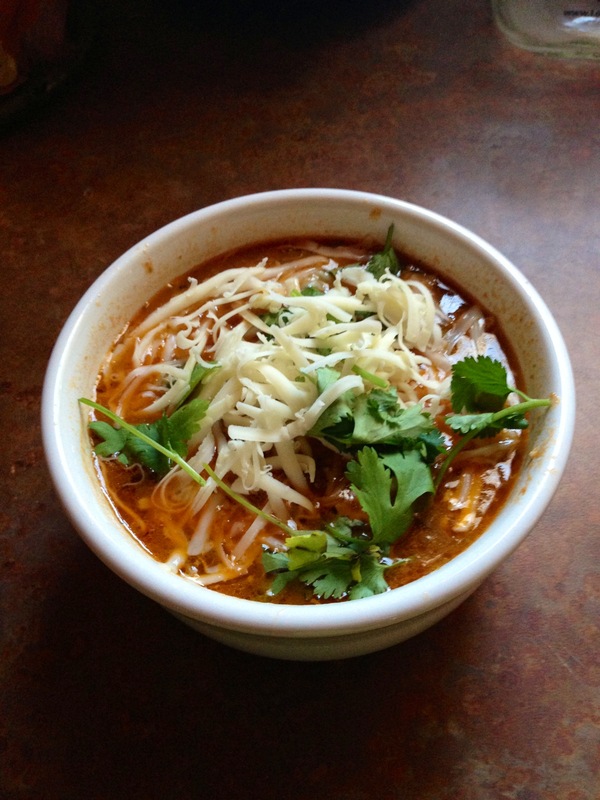 Perfect for a snow day. This has a good amount of protein for a soup, as it has beans and chicken. You want to make sure that you add some sort of healthy fat, like avacado, so that you can absorb the nutrients from the tomatoes and chiles. In a large saucepan heat the vegetable oil. Add the onions and cook for 2 minutes. Once the onions have softened add the garlic and chiles and cook for another minute. Pour the chicken broth, tomatoes and beans into the pot and bring to a boil. Once at a boil lower heat to simmer and add your chicken thighs. Cook the chicken for 20 to 25 minutes. Once chicken is cooked remove from pot. When cool enough to handle shred it and set it aside. Add lime juice and fresh cilantro to the pot. In a serving bowl add a mound of shredded chicken. Ladle soup over chicken and top with a lime wedge, avocado slices and cheese. I teach art to high school characters. Recently I thought it would be fun to teach them needle felting. 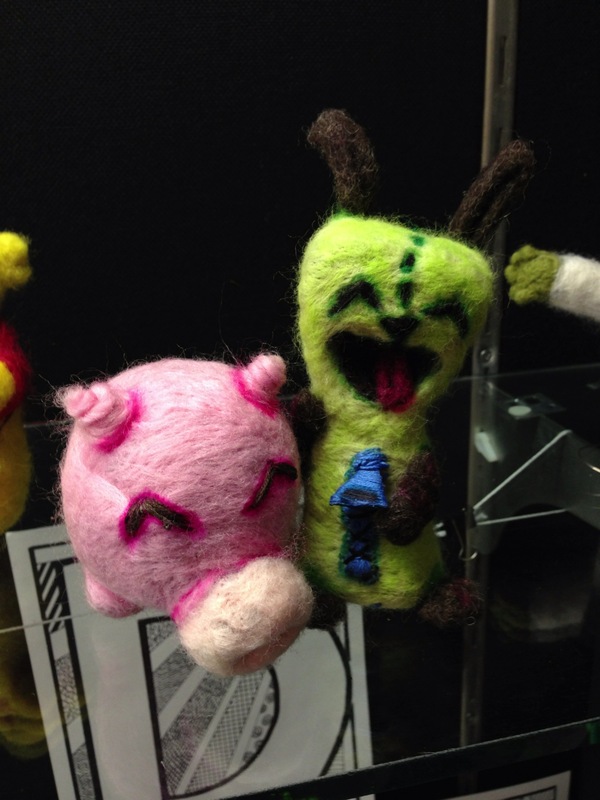 Needle felting is an easy craft that almost anyone can do and is extremely satisfying. To needle felt you need two materials: Wool roving and a Felting needle. As I was planning my lesson I thought I should talk to the kids about the properties of wool, where it comes from and how it has been used in the past. When thinking about where wool comes from I was inspired to contact a local farm that would sell us wool directly and it would really show students that we can support local business. So I took an afternoon to visit the farm. Different color wools were strewn around the kitchen, while at least 6 kittens played amongst them. The owner prepared a bottle and took me out to see her lambs and feed the babies. She then showed me around her studio where she prepares the wool for dying and selling. It was one of my best afternoons is such a long time. While there, the owner mentioned that she sold some of her lamb as meat. I am a realist. I like meat, I think it serves an important role in my diet, and as I am going to eat it I like to know where my meat comes from. The lambs at Cathy’s farm are well taken care of and loved. They have a lovely life. I bought a whole lamb and thanked the lambs for providing me their lives for the continuation of my life and my family. From “Slow Cooker Revolution,” by the editors of America’s Test Kitchen. Microwave onions, oil, paprika, garlic, tomato paste, cumin, cardamom and cayenne in a bowl, stirring occasionally until onions are softened, about 5 minutes. (No microwave? Sauté the onions in the oil with the spices and tomato paste.) Transfer onion mixture to slow cooker. Stir in tomatoes with juice, broth, tapioca, vinegar, bay leaves and sugar. Season lamb with salt and pepper, and nestle into slow cooker. Cover and cook until lamb is tender, 9 to 11 hours on low or 5 to 7 hours on high. Stir in cilantro, season with salt and pepper to taste, and serve.